Nona is a 43 year old lady who came to us seeking help with weight loss and a fatty liver. She only needed to lose 20 pounds, however all her weight was sitting on her abdominal region and the fat had crept into her liver. Nona had been diagnosed with a fatty liver a year ago. Her doctor told her she could reverse it if she lost weight. The problem was, Nona had been trying to lose weight nearly all her life and hadn’t succeeded. Nona knew she didn’t eat well. 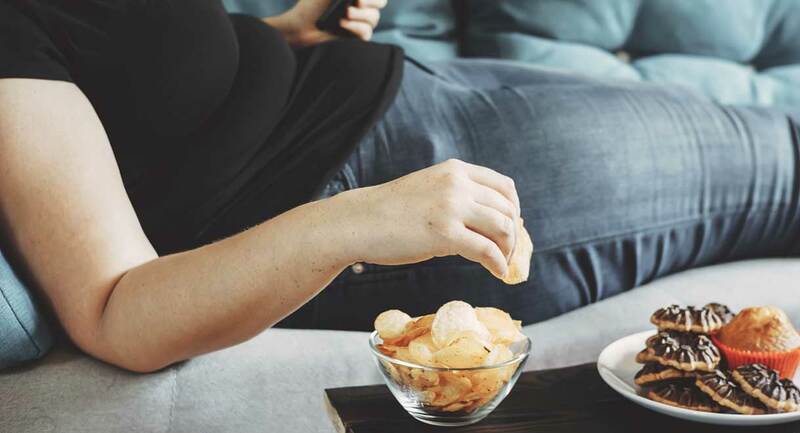 She made an effort to prepare healthy meals most days of the week, but she could not stay away from unhealthy snacks. Nona had quit smoking three years ago and she wrote on her questionnaire “Ever since I quit smoking I cannot stop eating”. She never felt satisfied after a meal and told me if she didn’t have to work and look after her kids she’d be quite happy to just eat all day. She said to me “I’m so over feeling this way and I really need some help”. I needed to help Nona get her cravings under control; otherwise her chances at weight loss were dismal. Nona was taking several prescription medications: An antidepressant (Prozac), Synthroid for an under active thyroid gland, a Mirena IUD to control heavy menstrual bleeding, and medication for asthma that she took as needed. When I checked her hormone levels with a blood test everything was normal. However, Nona’s vitamin B12 level was low, so I gave her a supplement. She was also low in vitamin D, so I asked her to take 5000 IU per day. Vitamin D deficiency can stall weight loss and worsen metabolic syndrome, which Nona had. On her questionnaire, Nona described the terrible digestive problems she suffered with. She felt constantly bloated, was constipated and had lots of reflux. Tomatoes and citrus fruits made her a lot worse, but she had quite bad reflux all the time regardless of what she ate. I asked Nona to take a magnesium powder. 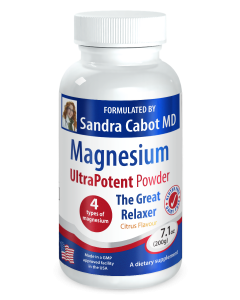 She was going through a lot of stress at work and magnesium is wonderful for improving stress coping abilities. Nona snacked whenever she felt stressed and overwhelmed, and magnesium would be great for calming her down. 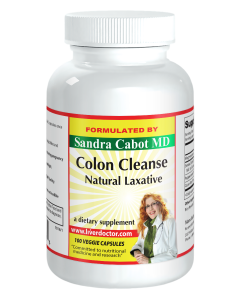 It can also help to relax the muscles of the bowel, therefore promotes more regular bowel habits. I asked Nona to take one Glicemic Balance capsule with each meal. The herbs and nutrients in this formula help to stabilize blood sugar. It was the wild fluctuations in blood sugar, combined with stress that drove Nona to snack on sugary or salty snacks all day. It was important for Nona to change her diet. I asked her to remove grains and dairy products. These foods are common culprits in the type of digestive problems Nona suffered with. Bloating and reflux are often caused by small intestinal bacterial overgrowth and an overgrowth of the wrong microbes in the bowel. 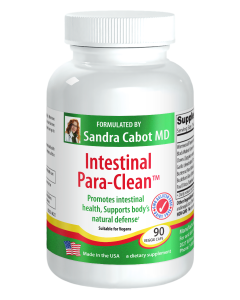 I gave Nona Intestinal Para Cleanse capsules to remedy this, and Colon Cleanse capsules to get her bowels moving and relieve the constipation. Nona had been trying to lose weight for many years but had been going about it the hard way. She was following a low fat diet and was not eating enough protein. Protein and healthy fats are the most important nutrients for helping to keep us feeling full and satisfied for longer. I was not surprised that Nona snacked all afternoon when she ate fat free chicken breast and salad for lunch. The eating plan I put Nona on is in my book "I can't lose weight! ...and I don't know why". It is based on vegetables, salads, protein and healthy fats. Examples of protein rich foods to include in meals are poultry, eggs, seafood and red meat (preferably pastured). Examples of healthy fats include avocados, extra virgin olive oil, coconut oil, oily fish, nuts and seeds. I saw Nona again four weeks later. She told me she had been eating larger meals than she ever had, yet lost 7 pounds. She rarely needed to snack between meals because they kept her feeling full so long. She said to me “I’ve never known what it’s like to not think about food all day, especially when I’m dieting”. I was happy to hear that Nona’s digestive problems had cleared. She also reported much improved energy levels and mental clarity. I plan on checking the state of her fatty liver in another 6 months.